Well, Sh*t. | Discernably Me! I left work early by just a few minutes. I didn’t think that the streets were all that bad. But I’d only travelled five blocks when it happened. And I saw it coming the whole way and couldn’t avoid any of it. I was headed south down Penn in the inside lane. 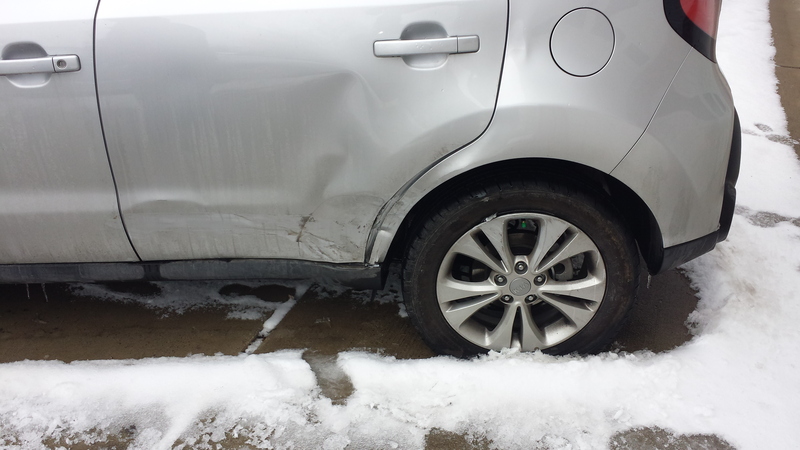 A Kia Rio Cinco heading north started changing lanes from the outside lane to the inside and lost control, then over-corrected. I had room to change lanes and did but I couldn’t get far enough, fast enough. The other car smacked my driver-side rear wheel and threw me into the curb. I managed to stay in my lane and get control without anyone else getting involved. But when I tried to move forward, the car didn’t respond. I looked at my instrument panel and saw the anti-lock symbol and the tire inflation symbols were both on. The car computer wouldn’t let me accelerate. I had to wait until it was clear to get out of the car and see the damage. When I was thrown into the curb, it broke my passenger-side axle/strut. The offending car had pulled up behind me. SJM rolled down her window and told me that she had called 911 and that they weren’t going to send anyone because of the weather conditions. It was 4:55 pm and 19ºF. We exchanged insurance card pictures and phone numbers and called our insurers. Progressive handled all the details and made the arrangements. They would have a tow-truck there as soon as possible. Once we were off the phones, SJM kept apologizing and making sure that there wasn’t anything she could do. I told her that there wasn’t any point in her staying around. I even reassured her that I wasn’t angry or anything, just upset with the situation. By 5:30 pm I was alone. I had my hazards on. I sat in my car and waited. I called Thea. I called my boss. One driver pulled along side and asked it I was okay. 5:39 pm, I got an automated text saying a tow truck has been assigned to me. The estimated arrive time is 7:30 pm. I called and verified and let them know that my car would need a sled, not just a tow. 6:00 pm a police cruiser pulled up behind me. He’s going to stay there until I’m towed. 6:15 pm, a gas meter at 32nd and Penn caught fire. Flames were shooting up over the rooftops of houses. In the next five minutes there were five police cars and three fire engines with lights blazing in the street two blocks in front of my car. My little hazard lights seemed insignificant to the task of warning drivers. But with the mass of lights and action and flames in front of me, people slowed down long before they got to me. The downside was that the officer returns on foot and requested that I wait outside of my vehicle since it was not as visible and therefore not as safe. 7:00 pm, I got a call from Progressive that a tow-truck was en route and would be there at 7:45 pm. Two more people asked me if they can help. 7:30 pm, Engine 10 pulled up behind me. They were leaving the scene of the fire and just wanted to check on me. The Gas Co. truck stopped by to let me know that I was a safe distance away from their work and not to be worried about an explosion. Two different tow-trucks had arrived to move cars away from the gas meter so that they could work on it. The police asked if I wanted to use one of them. I declined. 8:00 pm, my truck arrived. He took stock of the situation and let me know that in moving my car to the sled, my wheel may break off. He had me sign a form. I verified that he’s going to be taking me all the way to Norman. That’s the plan. It took some time with all the traffic again to get my car loaded. 8:20 pm, we were moving. He’s from Mustang and needed direction to get to Norman. He says that he could just put it in the GPS but would rather know from me. 9:10 pm, I’m home. I had Thea move her Mazda2 behind my Civic so he had a full double driveway to drop my car in. The wheel did not come off but while unloading it, I could hear metal warping and the wheel’s angle deformed. It’s going to have to go through this process again on Monday when Progressive has it moved to their claim center. The worst is over. Now I just have to deal with the rest. There’s always a bright side: no one got hurt.